As minstrel Harry Macarthy, singing "The Bonnie Blue Flag" for the Northern Virginia high command in the U.S.O.-type performance. Macarthy wrote these verses to the tune of "The Irish Jaunting Car," a vaudeville song from his native country. The Bonnie Blue Flag was popular enough to become one of the unofficial Confederate national anthems, alongside "Dixie" and "God Save the South". During the battle of Fredericksburg, it shows brigades charging one after another with a period in between each. However after each brigade is shown charging, the previous brigade seems to disappear from the field. Only a few soldiers are shown falling back, far too few to make up even the most devastated brigades. No reenactors were credited individualy, rather there was general thank you to all the reenactors who participated in the filming. The Director's Cut of the film includes additional action scenes from the Battle of Antietam. 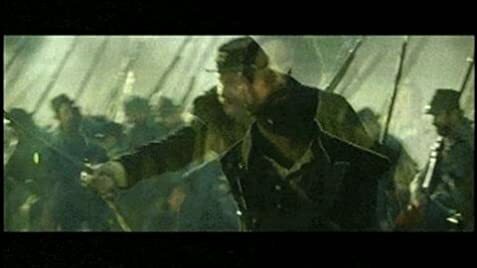 The battle scenes are shown from the perspectives of Jackson and Chamberlain, and mostly focus on the fighting in Miller's Cornfield which was a major deciding point of the battle.